Leyton Orient and Blackpool fans to hold joint demonstration ahead of and during their game on Saturday. 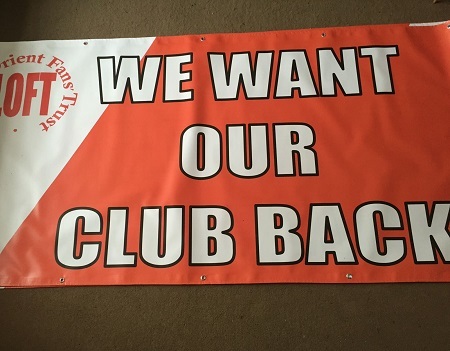 This Saturday, 19 November 2016, supporters of Blackpool and Leyton Orient will join together ahead of their match at Brisbane Road, to send out a loud message to both clubs' owners: "WE WANT OUR CLUBS BACK". Blackpool supporters' disaffection with the way the Oystons are running their club has been well documented, and Leyton Orient fans are increasingly unhappy at the way Francesco Becchetti is running their club. A march has therefore been organised jointly by the Blackpool Supporters' Trust (BST) and the Leyton Orient Fans' Trust (LOFT), following backing from their respective members. The march will start at 2pm outside the Birkbeck Tavern on Langthorne Road, Leyton, where LOFT held its AGM last Thursday. It will then head via Leyton tube station down Leyton High Road, finishing near the ground. BST and LOFT are calling on both sets of fans to send a clear message during the game to their clubs' respective owners that they support the team, not the regime. Marking the fact that both clubs were formed in the 1800s, the trusts are calling for the 18th minute of the game to be the time that the Orient fans 'Stand Up for the Orient' and the Blackpool fans sing their equivalent. Subject to how the game is going, fans may or may not want to repeat this around the 80th minute (to mark that both clubs were formed in the 1880s), but the trusts are sure that both sets of fans will continue to Stand Up for their Football Clubs now and in the future.